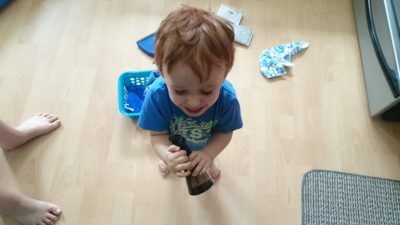 So you want to get your toddler cleaning? Maybe because your toddler made a big mess doing a fun painting craft. Or in addition maybe you just need some relief on the entertaining aspect of parenting. I don’t know what it is like to have two yet but I know with having my one that it is hard to keep him entertained. 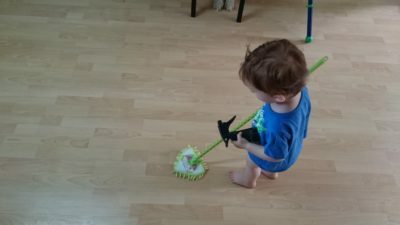 The house still needs to get cleaned and yet the toddler still needs to be stimulated and actively engaged. I’ve always taken the thought that the best way for a child to learn is through actively participating in things at whatever level they are able to. 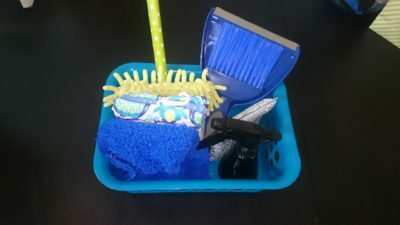 In comes the DIY Dollar Store Cleaning Kit. 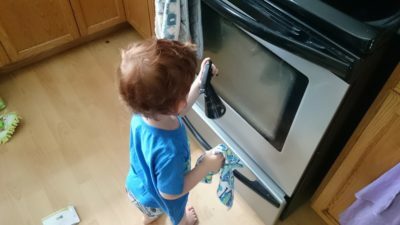 My Toddler cleaning? What could be better! Sure my standard of clean is nowhere near his abilities, however it’s not about that. 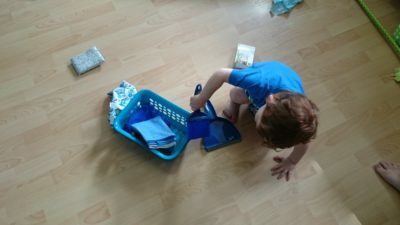 Him being involved in what Mommy is doing is his version of playing and my version of getting two things done at once. How exciting for him to be able to do things like Mom with tiny versions of my tools to make him feel like the big boy he really is. So off we went to the dollar store and grabbed a bunch of things to make our little helper his own basket of cleaning supplies. The silver scrub sponge and the dust cloth I already had. I would say maybe total together they were $2? That is the beauty of this kit. You can really put whatever you want in it. Clearly we don’t want our tiny toddler using harsh cleaners or chemicals to clean. We use mostly vinegar and Dr.Bronners at our house anyway. So for his tiny spray bottle I do about 1/3 Dr.Bronners Castile soap and the rest water. OR just water! It really doesn’t matter considering the amount of cleaning they actually get done is minimal. There you have it! 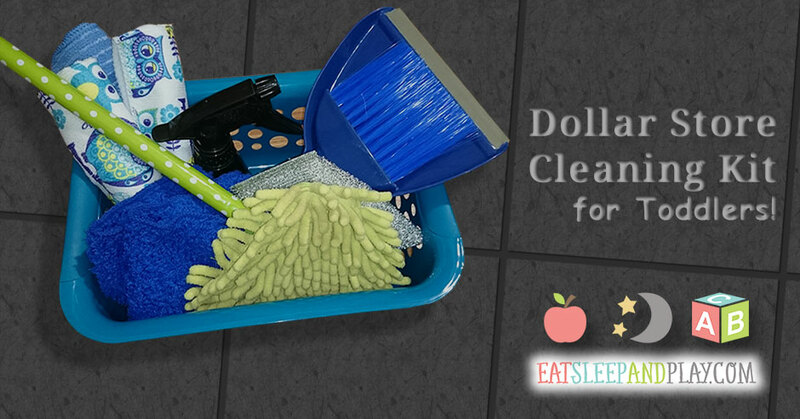 Now your little toddler can exchange getting in your way of cleaning to feeling like they are helping you get the job done. I’m hoping this helps him maintain the routine of helping Mommy clean up as well because I want cleaning to be positive. We put on music, dance and sing songs while we clean. Mainly nursery rhymes but hey, one day he might bust out a Beyonce song with me. Clean his toys and learn the importance of taking care of his things. Tell us in the comments how your cleaning experience is!